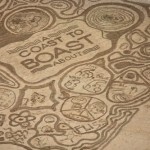 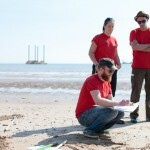 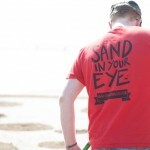 On a sunny Wednesday, the Sand in Your Eye team headed over to Bridlington to create a giant sand drawing for Yorkshire Waters event to tell everyone about their ‘A Coast to Boast About’ project. 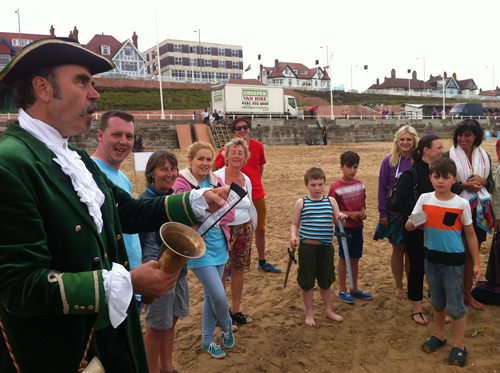 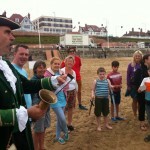 The event was designed to tell the public all about the £40 million development at the seaside town that will make sure that it has some of the best quality bathing water in Europe. 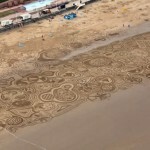 Jamie, Sam and Tom were excited to get involved with the hundreds of people who flocked down to the beach to take part in creating a giant sand drawing. 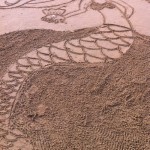 The team went with a design that resembled rippling water and each group of people had their own space to make their masterpiece. 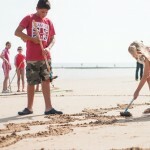 The ripples stretched far down the beach with hundreds of families and individuals were working on their drawings with the expert guidance from Jamie and Sam to help them with their raking technique. 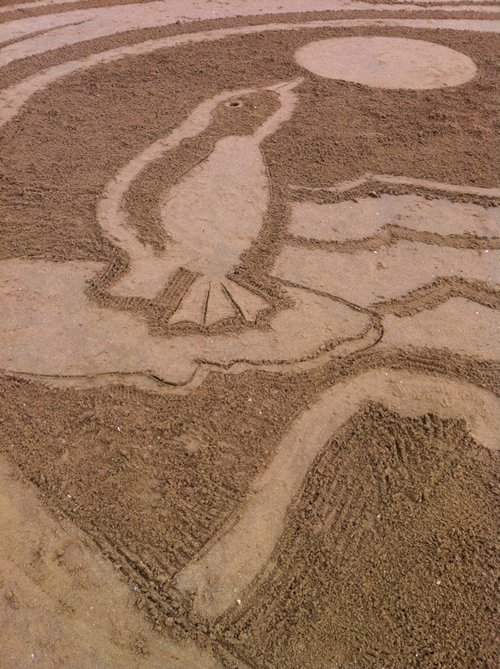 We were very lucky with the weather and we spent around 5 hours on the beach, watching the drawing grow and grow as the day went on. 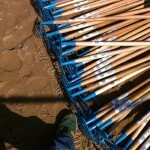 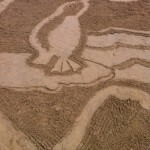 The public were incredibly talented and came up with some really imaginative designs making our job that much easier. 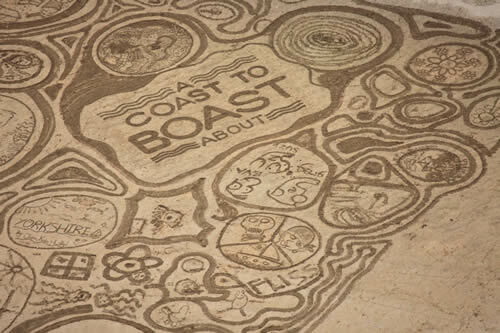 At the bottom of the drawing, Tom drew the ‘A Coast to Boast About’ logo and discovered the revelation that is ‘rake cam’, capturing sand drawing like never before. 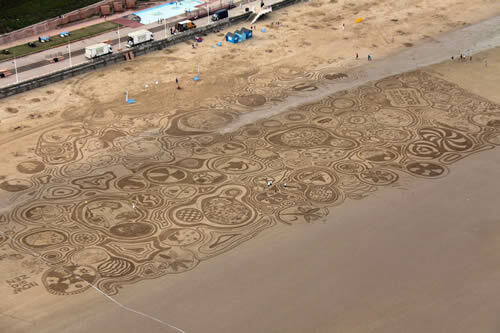 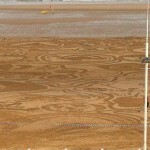 As the day wore on and the crowds thinned out, the team finished off the last bits of the giant sand drawing as the helicopter passed over, capturing the image from the air. 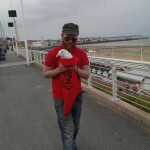 As we were packing up the van, Jamie found a poor seagull that had become trapped in a glass balcony. 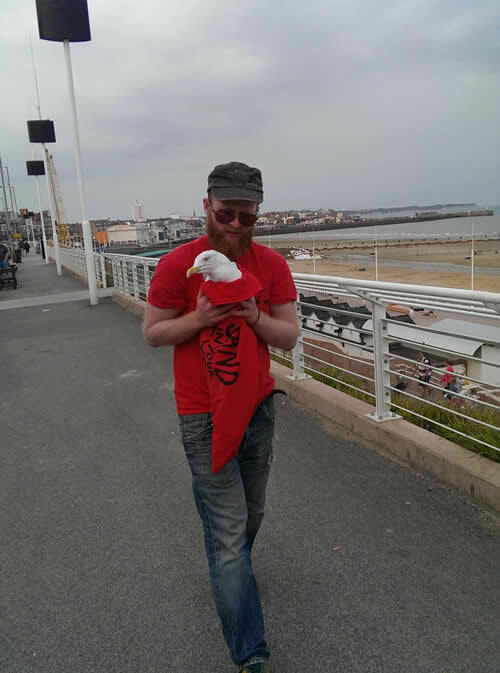 He bravely approach the seagull and gently wrapped the bird in Tom’s t-shirt carrying him to safety then we watched him fly away to catch up with his friends. 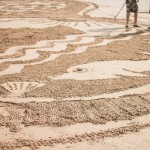 The great thing about sand drawing events like this is that people of all ages can get involved and add their own ideas to help make something that is totally unique. 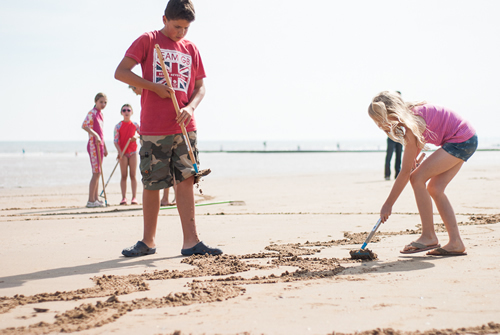 It’s always great to see families working together and having a really good time in the sunshine. 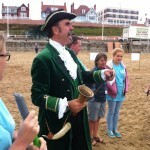 Thanks to everyone who came down throughout the day and Yorkshire Water for putting on a great event.